The Greek warriors released their second full-lengthed album 2 months ago... if you haven't purchase it yet then it's your fault... those of you who have heard it allready know that it's a masterpiece! We had the chance to talk with Gus (bassist)... you have teh chance to read it! A roar coming from the past! Greetings! Here we are again after 2 years from the release of your debut album. Can you please tell me what has changed and what has happened during these last years? Hello guys! I m Costas, the bassist of the band and first of all I d like to thank you both, for giving us the chance to say a few words about our new cd. Well, two years indeed since the release of the first cd and we really had a very busy time. 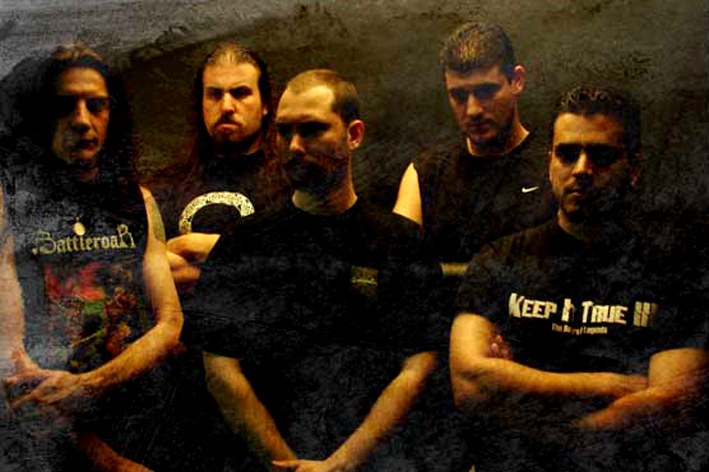 We‘ve played many gigs in Greece and in countries like Germany and Italy and then we started work for the Age of Chaos. At the same time we went through many good and bad moments in our personal lives but right now we re very happy with our new album which is a result of hard work and effort from our music label and ourselves. We always read any kind of reviews or opinions, good or bad and we re taking seriously every one of them. But in terms of songwriting I don’t think we would ever consider any requests from someone. I’d say that some ideas or riffs for this album were existed for a long time, even before the first cd. To be honest with you we didn’t have any clear idea of how the new songs would sound. We just wanted a more rich sound. So everything came in a natural way. I have to say that I find the new songs more “solid” from those of the previous album. That has to do with Marco taking part into writing sections. Can you tell us a few things about the procedure that you follow when you write a new song? I mean Marco lives in Italy while the rest of the band is Greece. I think that the Internet has save you some time and some money as well! I think you re right. Well, the truth is that that Marco has more part in the composition of the songs and all the songs are written to suit his voice now. It s not so easy for us you know. Both me and Marco we re living out of Greece so we can t work as we would like to when we re writing new songs. The times we have to do rehearsals all together are only a few actually so as you mentioned the internet is helping us lot. I don’t think that there was ever a question of dedication in our band. We were committed from day one. We try hard despite all the difficulties and I think that the music development of the band generally is really huge. Although we can t read the future the only thing I know for sure is that we will continue with commitment to our music, our band and our fans. Tell us a few things about the recording sessions. Where did it happen and who took part at this? The recordings started in early June, at Studio 222 in Athens. We recorded the drums, bass, keyboards and the violin. Following that Kostas, Manolis and Nick met Marco in Milan, at Conquest Studios were guitars, vocals and the final mix took part. The production was done by Alex Festa who is well known from his work with Jeff Scott Soto, Doomsword and Wotan and many others. Like in your debut, in your second release you have a couple of special guests. The one is Mark Cross and the other Mark “The Shark”. Tell us a few things about Mark. I heard that apart from helping with the drums’ recording and production he also played some parts in the album. I think that he assisted a lot Nick. Don’t you think? Mark and I met a long time ago from the time we played together with Spitfire. We re very good friends since then and by the time he met the rest of the guys. So we thought that his help during the recordings, with his experience and knowledge, would be very important and useful for us. So it happened and I think that he helped Nick very much and they both did a fantastic job. He also played a part in Calm Before The Storm. Mark sings in The wanderer and he also played a solo in Calm before the Storm. What can I say about this man! He s one of the most amazing persons I have ever met in my life! His contribution in our cd is a great honour for us and especially for the rest of the guys who are huge Manilla Road fans. We have to mention that you now “belong” to a new record label… Black Lotus Records. Why did you choose a Greek label instead of a foreign one? Are you satisfied with your cooperation by the time being? We had a one album contract with Omicron Music, so by the end of it we had a number of offers to consider. Eventually we joined Black Lotus for several reasons. First of all it was a very good contract, which fulfilled our needs as a band and we have a complete artistic bfreedom. It is a Greek label also, which is a great advantage because the band is based in Athens. They re a very professional and well organized label and we re 100% satisfied for their support and I think they have done a great job with the whole package of the cd and the promotion generally. Does Battleroar have anything to do with BLR signing Manilla Road? As far as I know, no! The first gig will take place in Athens on December, 3 at Underworld club. Then we re going for a mini tour with Airged L’amh in Europe. In the late 2 years many Greek bands have the chance to play outside Greece. What do you think about it? Which are your plans for the future? Is there a deal for a 3rd album or something like this? Well there s a deal for one more album with Black Lotus. But at the moment there are not any new songs ready. For now we just want to promote Age of Chaos and play as many gigs as possible. Well we have reached the end… Please feel free to tell anything you like… I want to say that is always a pleasure to talk with people and bands like you! UP THE HAMMERS! I just want to thank you both very much! Cheers!